Katy Langley lives downstream from many of those farms. "When you fly over the area, you can't throw a rock without hitting one," she says. "You see these long barns and these square shapes that are Pepto Bismol pink, because swine waste is bright pink. Fun fact of the day!" It's actually bacteria, feeding on the waste, that turn the ponds pink. These lagoons are like a pile of compost. They're a cheap way to handle animal waste. But for Langley, the lagoons are a threat. She works for an environmentalist organization called Sound Rivers, and she's specifically assigned to protect the Neuse River. With thousands of those lagoons just sitting there, open to the weather, with a Category 4 hurricane on the way, Langley is worried that a whole lot of manure is going to wash into the rivers. "We're probably going to get hit on the nose with this, so flooding's our biggest concern," says Marlowe Vaughan of Ivy Spring Creek Farm in Goldsboro, N.C. The hog houses themselves are safe from flooding, she says, but paths leading to them could be flooded, so that workers will have to get to them by boat. On her farm, they're spending part of the day pumping liquid waste out of their lagoons, spraying it as fertilizer on nearby fields, so there's more room for incoming rainfall. 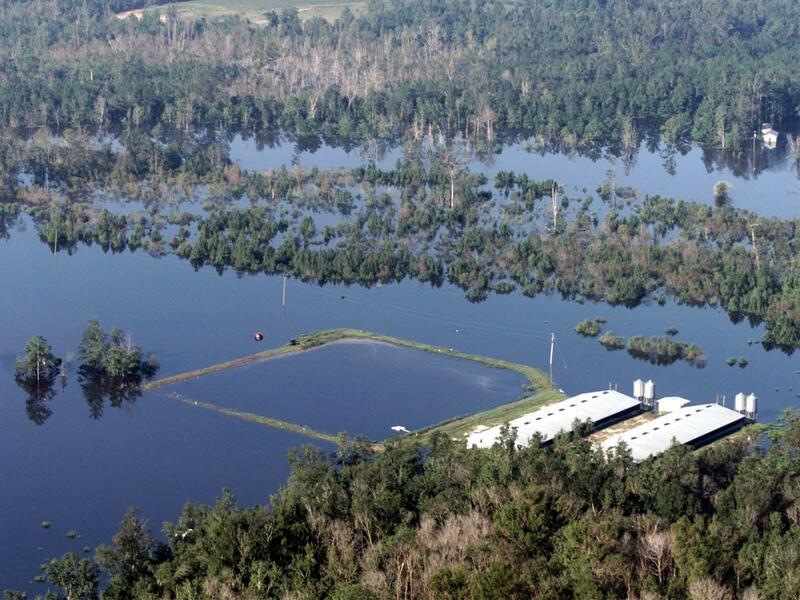 Experts at North Carolina State University say that if farmers manage to do this ahead of the hurricane, lagoons should be able to handle almost three feet of rain. But these facilities haven't ever been forced to accommodate that much rain. I ask Vaughan if the ponds really could handle such a deluge. "We don't really know," she says. "I mean, we try to pump down as much as we can, but after that, it's kind of in God's hands. We're kind of at the mercy of the storm." But Vaughan says, history may not be a guide. It sounds like Florence could be worse. "We really just don't know," she says. "We have no idea what's going to happen. So everybody's very worried and very concerned. Please pray for us!"